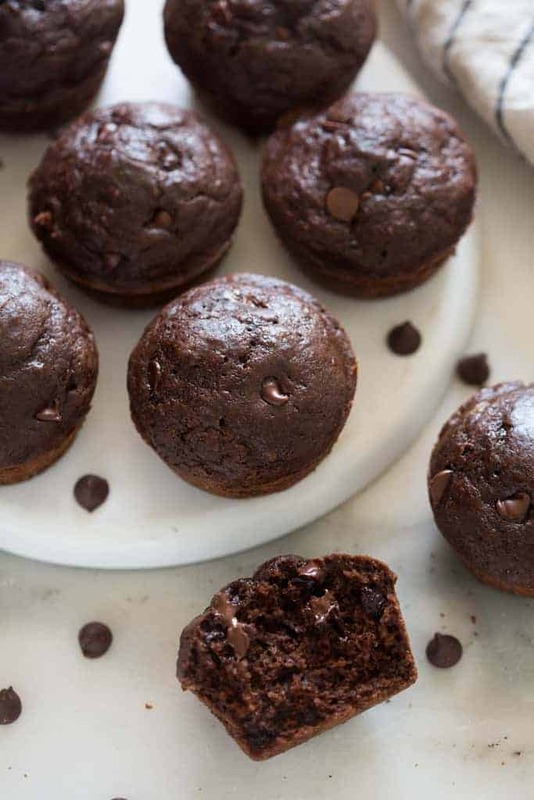 Double chocolate chip muffins you don’t have to feel guilty for indulging on! Made with whole grains and greek yogurt to make them extra moist. Any fellow Costco super fans out there? It’s almost a weekly stop for me. I love their produce, meat selection and pretty much never leave the store without a rotisserie chicken. The one thing that I always drool over, but never buy, is the muffins from their bakery. My hips really can’t afford to have those hanging around the house. But every once in awhile they will offer them as a sample and my day is MADE. YUM. Also, just like so many of my other favorite muffin recipes, these freeze wonderfully and make for a great grab-n-go breakfast or snack. 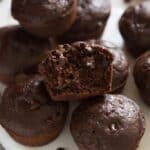 These skinny chocolate muffins are way healthier than any store bought version but they still have the same great flavor and texture. Chocolate for breakfast, anyone? 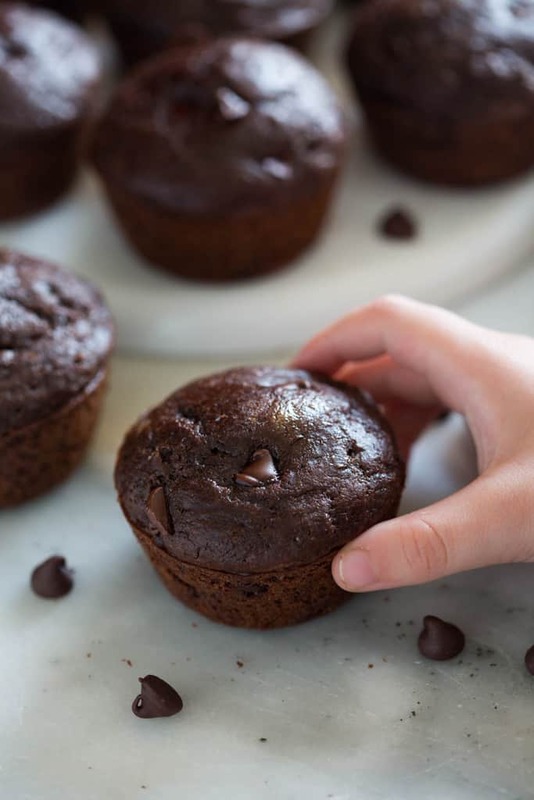 Double chocolate chip muffins made you don't have to feel guilty for indulging on! Made with whole grains and greek yogurt to make them extra moist. Preheat oven to 325 degrees F. Lightly grease a standard 12 cup muffins tin with non-stick cooking spray. In a large bowl, combine the dry ingredients: flours, sugar, cocoa, baking soda, cinnamon, salt and chocolate chips and stir to combine. In a medium bowl, beat together the eggs, yogurt, milk, oil and vanilla. Make a well in the center of the dry ingredients and stir in the wet mixture, stirring just until moistened (don't over-mix). 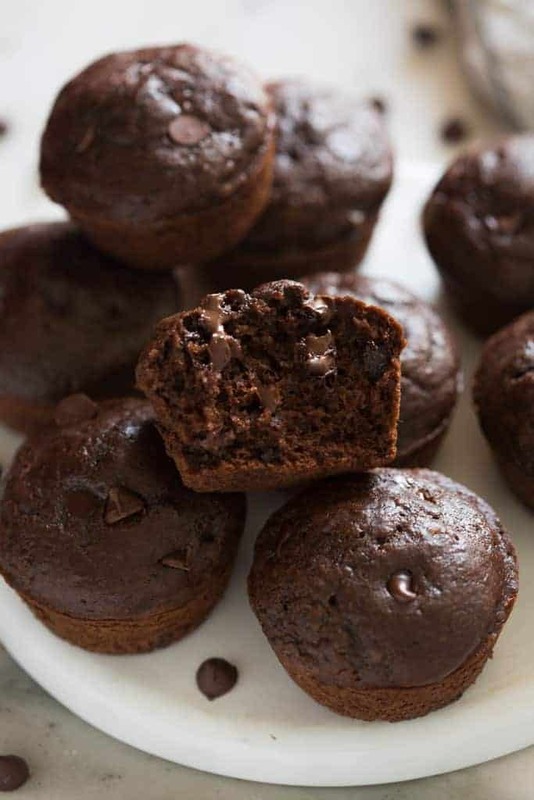 Fill muffin cups 2/3 full with batter. Bake for 15-18 minutes, or until a toothpick inserted in the center comes out clean. Remove to a wire rack to let cool completely. My kids loved them. These will be one of the staple muffin snacks in my home now. Thanks! I’m 10 years old and I absolutely love to bake. I made the muffins and enjoyed making them. I also loved eating them they turned out super moist. Thank you so much! This sounds lovely! Could I use only whole wheat flour instead of half and half?